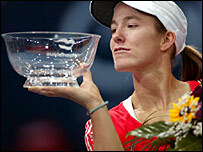 Justine Henin claimed her ninth title of a spectacular season with victory over Tatiana Golovin in the final of the Zurich Open on Sunday. The world number one stretched her unbeaten run to 20 matches with a 6-4 6-4 win over the 19-year-old Golovin. The Belgian followed up her defeat of France's Golovin in the Stuttgart Open earlier this month. "It's been the best season of my career and to win my ninth title of the year is pretty amazing," said Henin. "I needed a bit of time to come into the match today as Tatiana was putting me under a lot of pressure but slowly but surely I came back." Golovin made the better start, breaking for an early 3-1 lead before a net-cord helped Henin get back on level terms. Three unforced errors from Golovin handed up another break and Henin closed out the set before getting the best of three successive breaks at the start of the second. "She's absolutely the best," said Golovin. "She's so solid, but she has also been a great inspiration to me, and the more I play against top players like Justine the more I hope to learn."